Palm Trees and Paradise. 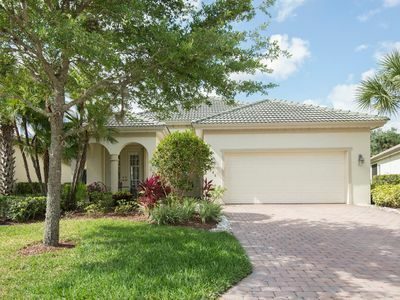 Newly Updated Condo! There’s no place like home, except the beach. 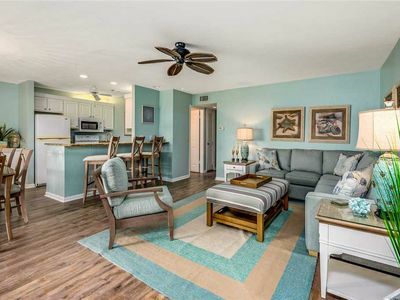 Come relax in this third floor condo in Casa Marina! 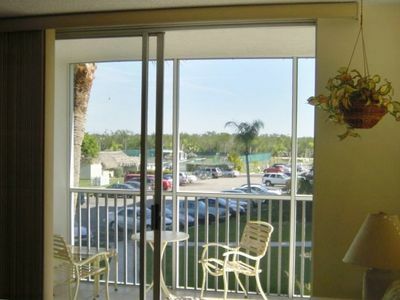 Every window provides a different view of Fort Myers Beach! 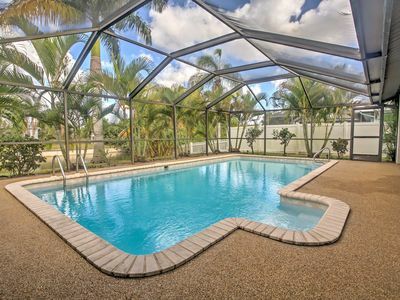 Enjoy a view of Estero Bay from the kitchen window; there is a view of the canals from the large tiled lanai. Watch boats come and go from the canal and you may even spot a manatee or a dolphin swimming by. The building is located next to the large pool that has plenty of lounge chairs for relaxing as well as a morning water aerobics class! 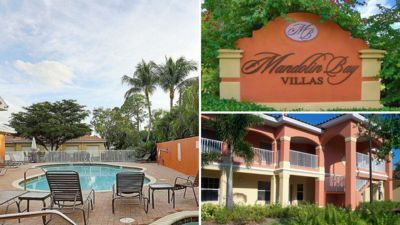 This spacious, new updated third floor condo has 2 bedrooms, 2 bathrooms, a fully equipped kitchen and has central air conditioning. The spacious master suite has a queen size bed, a TV and a private bathroom. The guest bedroom has two twin beds and a separate bathroom. Both bedrooms offer large walk in closets, new linens and ceiling fans for additional cooling comfort. 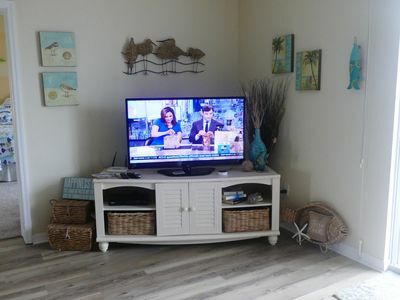 The living room and master bedroom open to a large screened in lanai, where you can enjoy the breeze, smell the salt water and take in the beautiful views. The kitchen has everything you can want or need for preparing your meals. Guests can sit at the breakfast bar and chat while you prepare meals. 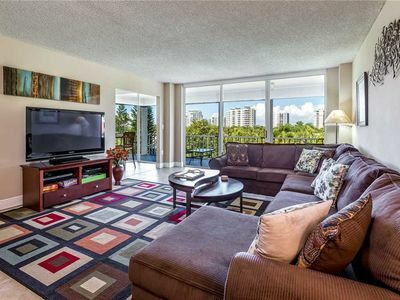 Enjoy your meals sitting at the dining room table or move to the lanai and enjoy the view! There is a brand new, full size washer and dryer for your convenience. 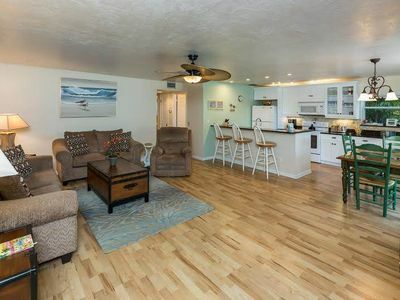 Amenities include free cable and Internet, access to the heated in ground pool, and a private deeded beach entrance. 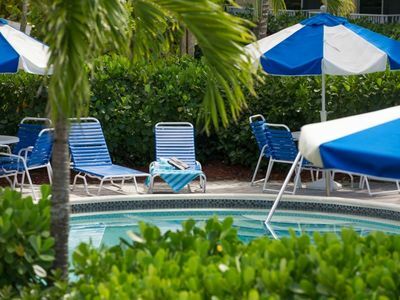 The beach access is a short 10 minute walk and beach chairs, umbrellas and a beach cart are provided in the condo. Stroll the seven miles of sugar sand and keep an eye out for dolphins and some of the best shelling on the gulf! The sunsets at the beach are amazing (don’t forget your camera)! 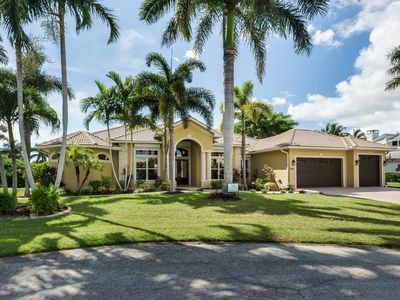 Casa Marina is located at the quiet end of Fort Myers Beach. Santini Plaza is a short walking distance away. Here you will find a variety of shops and restaurants. The Fish House Restaurant is a favorite! At the Fish Tail Marina you can rent boats, buy fishing bait, go on local excursions such as fishing charters, dolphin watching and sunset tours. Times Square is four miles north where you will find additional shopping, restaurants and nightlife. At the public beach you can rent water sports equipment and find local entertainment at one of the beach-side hotels, restaurants and shops. If you choose to not rent a car, the Fort Myers Beach Trolley services the Island and has stops all along the beach. The Fort Myers Beach Trolley runs from Bonita Springs to South Fort Myers near Summerlin Road. If you have any questions, don’t hesitate to ask!